My name’s Tony McVeigh, a fellow Futurequaker from Northern Ireland. You may remember me from my rather unsavory Angel Gang story ‘The Birthday Gift’ in the latest issue of Zarjaz. Anyway, I’m chuffed to say I have a project called ‘Devil’s Music’ in Round 2 this year’s SMALL PRESS IDOL competition. The voting that will decide if our project will make it to round 3 has just opened up. I would greatly appreciate any support that my fellow Zarjaz/Futurequake alumni could give me. You can vote for the project once daily from now until next Wednesday. Every vote keeps us alive. So sign up and give your fellow droid a helping hand. 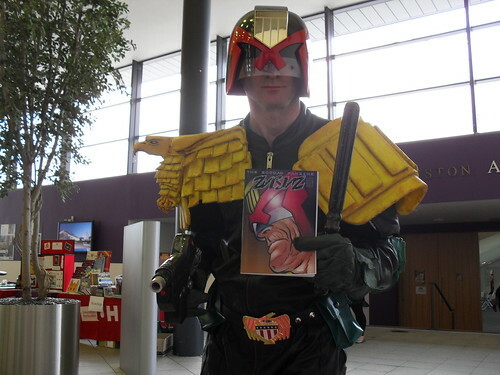 Unicon was attended last week by the brothers Denton, and they were kind enough to take some copies of the latest Zarjaz & Dogbreath along as well. They even got a Jimped! Serious congratulations to GQ and Keiren, and I hope to be able to score a copy as commissioning editor! Title Rogue Trooper- A Tale of the Trenches is written by Richmond Clements, with art by George Coleman. 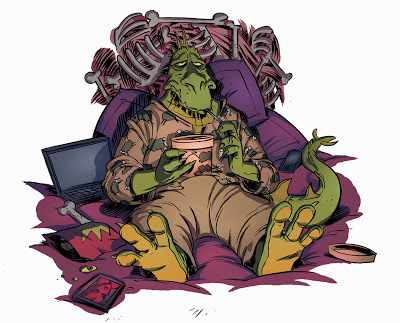 The strip is five pages long and will feature in Zarjaz 10. Title Slaine- A Place of Shelter is written by Alec Robertson, with art by Roland Bird. 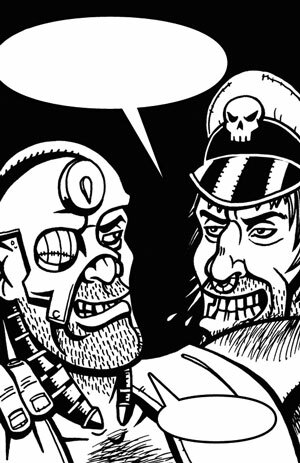 The strip is four pages long and will feature in Zarjaz 10. Forgive me for posting this so late- but this weeks prog has a rather nice treat for the contributors to both Zarjaz & Dogbreath. An unsolicited pimp. 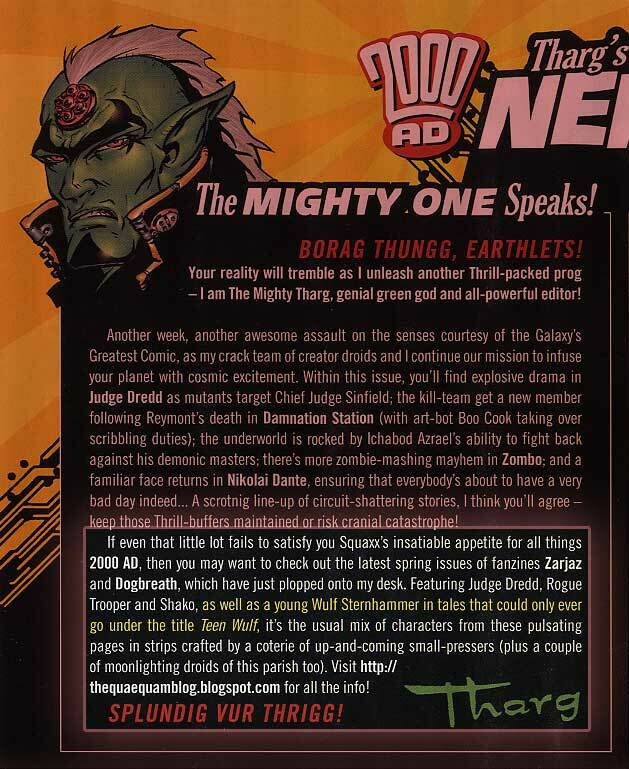 His verdant majesty, Tharg the action-figure Model, saw it fit to mention that he liked the new crop, and he gave special mention to the mighty Teen Wulf strip by Richmond and Kev Picture from Kev’s blog- Thanks, mate. has posted this on her blog: ZUDA!! I would like to announce that I, along with writer Brian Joines and letterer Michael Thomas have been selected for the April 2010 Zuda Comics competition! Our project is called ‘Mr Trildok Sings the Blues’ and its about a demonic creature going through the woes of divorce. Its humor with a bunch of fantasy in a modern day setting. For those who don’t know, Zuda is the webcomics site of DC Comics. The first place on every monthly competition gets a contract for at least a year, producing the winning project. And everyone can follow the story, on the website, for FREE! And after, if you deem us worth your while, please take some minutes of your day and VOTE for us!! It’s pretty quick, you just have to sign in, get the password in the email they send you, then log in and click the big VOTE on the right side of our story. Also, you can also add us to favorite and give us stars for extra support. And tell a few friends and family. I thank you all for the attention and time spent helping us out. So come on! Help out a FormerQuaker!